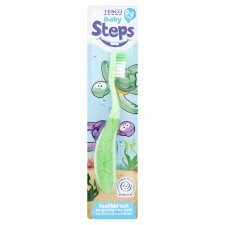 Steps Turtle toothbrush 0 2 years The Tesco Steps range of toothbrushes and toothpastes have been specially designed in conjunction with the International Dental Health Foundation to give the best possible care to your child’s teeth as they develop. Baby soft end rounded premium filaments to gently massage teething gums. Small head for your child’s tiny mouth. Easy grip handle. Colour may vary. IDHF approved Toothbrush for growing baby teeth. Baby soft filaments and small head. The Tesco Steps range of toothbrushes and toothpastes have been specially designed in conjunction with the International Dental Health Foundation to give the best possible care to your child’s teeth as they develop. Baby soft end rounded premium filaments to gently massage teething gums. Small head for your child’s tiny mouth. Easy grip handle.